The brownie recipe uses only 1/2 cup of almond flour and it’s sweetened with coconut sugar. 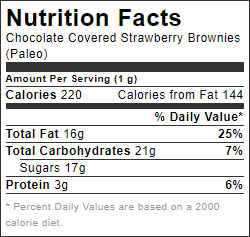 As for that gorgeous chocolate strawberry topping? 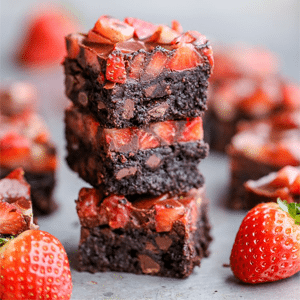 Diced fresh strawberries are sprinkled over the baked brownies and topped with a mixture of coconut oil, cocoa powder, and maple syrup that firms up to create a deliciously smooth chocolate layer. Preheat oven to 325ºF. Line an 8-by-8-inch baking pan with aluminum foil leaving overhang on the sides, spray with cooking spray; set pan aside. In a large microwave-safe bowl, combine coconut oil, coconut sugar, cocoa powder, salt, and heat on high power to melt, about 45 seconds. Stop to stir, and heat in 10-second bursts until mixture has melted and can be stirred smooth (mine took 45 seconds + 15 seconds). Whisk for about 30 seconds to help dissolve the coconut sugar into the oil. Add the vanilla, eggs, and stir vigorously until batter is thick, shiny, and well blended. Add the almond flour and stir until combined. Pour the batter into the prepared pan and spread evenly. Bake until a toothpick in the center emerges slightly moist with batter, about 22-25 minutes. Check with a toothpick - it should come out with moist crumbs attached. Don't over bake! 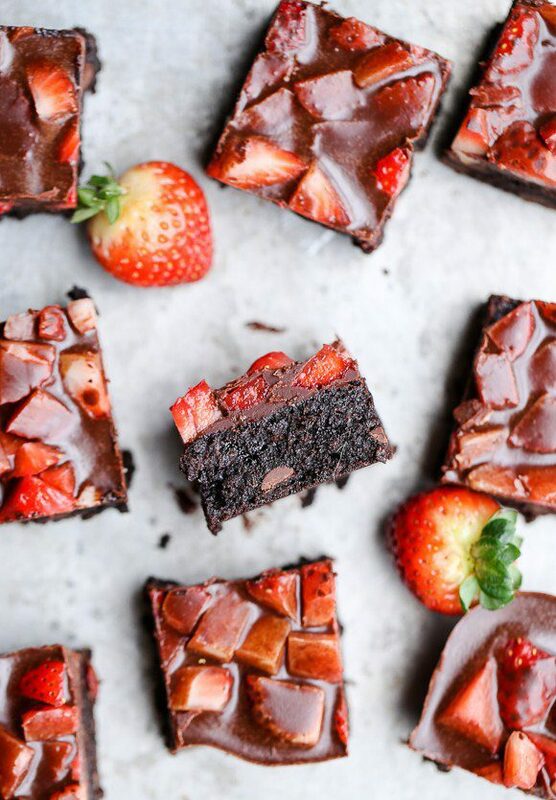 Let brownies cool completely. 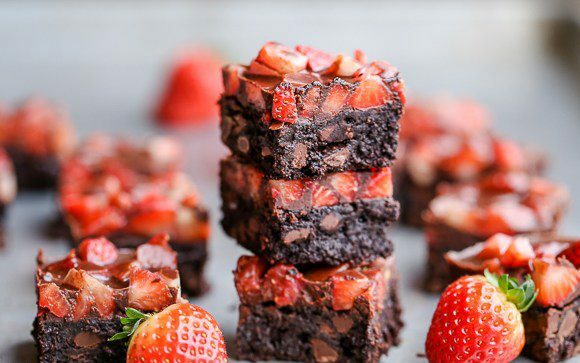 Spread the strawberries evenly over the brownies. In a small bowl, whisk together the coconut oil, cocoa powder, and maple syrup. 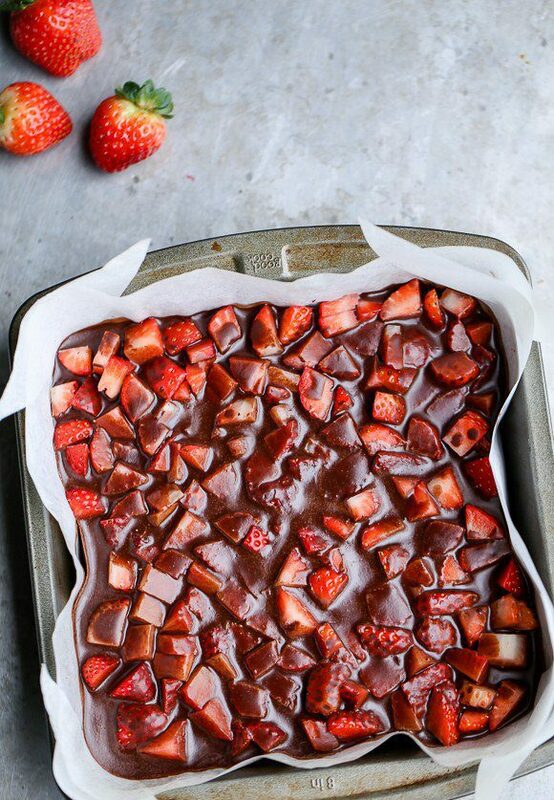 Pour evenly over the strawberries. Refrigerate for at least 1 hours before cutting into 16 squares. Brownies will keep in an airtight container in the refrigerator for up to 3 days.